Mama’s Note: Go to Claire’s blog and click into Amazon.com from there to get any of her books. She gets a small commission for each sale. You can also buy the Gadsden flags at Amazon. 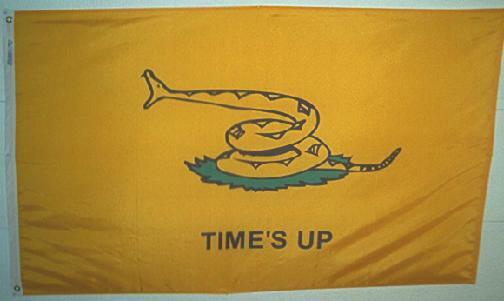 “Time’s Up” flag design is by DullHawk, and are no longer available as far as I know, but he has other merchandise with that theme. Several people in the liberty community clearly think that it IS. For instance, Bill Buppert talks about secession, which will (with 99.995% certainty) lead to violence. Read his take at ZeroGov.Com. Others have written terribly realistic fictional scenarios in which large numbers of “law enforcement officers” are mowed down in carefully planned and executed attacks: scenarios which make the ambushes in Dallas, Baton Rouge, Iowa and New York City look like little or nothing. And obviously, as those attacks show, SOME segments of society have decided to respond to the war that cops are carrying out against mundanes (civilians) by ambushing and killing cops. They have, by their actions, stated that yes, it IS indeed time to shoot. But now the 2016 election – supposedly the most divisive since the 1860 four-way foofarah – is upon us, and already the actual violence (not the rioters and protesters and the cops beating on the rioters and the protesters) is either at a very high level or is being better reported than in past elections. Campaign offices are being trashed and burned, supporters of various sides are being physically attacked, and the Secret Service is reported to be chasing all kinds of threats to the various candidates. More and more pundits and observers are stating that Tuesday the 8th, and probably the days after it, are going to see a spike in violence. Already, depending on who wins, there have been calls for, and worries about, assassination of the victor – and even of the defeated. And others claim that the one particular crime family is continuing to stack up bodies as they have done for three or more decades. Violence leads to more violence. Government and political masters’ violence inevitably will result in violence in response (revenge) or just self-defense (two different things). This has been the case from the Exodus on down to the present. We can see the consequences at many points in history; the Persian invasion of Greece resulting long-term in Alexander’s conquest of the Persian Empire. The various Roman Civil Wars. The Roman occupation of Canaan resulting in the Jewish War. The Muslim invasions of North Africa, Asia, and Europe resulting in centuries of war, but especially the Reconquista, the rise of the Austro-Hungarian Empire, the colonization by European nations of much of what is now the Muslim heartland, and more. The abuse of pilgrims in the Holy Land leading to the Crusades. The list goes on and on. Here in the Fifty States, we are seeing the results of more than two centuries of violence begetting violence. Raids by AmerInd tribal war parties resulting in punitive raids and conquest and imprisonment on reservations. Abuse of employees by robber barons and their companies leading to strikes and violence leading to more violence. Lincoln’s aggression against the Southron States leading to four years of bloody war, and a decade-plus of military occupation, and a century of racial hatred and violence. And more. Because people are people, and you can only push most people just so far before they resist, rebel, and fight back – whether they have any chance of success or not. The history of slave uprisings, and of the various AmerInd wars shows that. Regardless of who gets elected, either to Massa or the thousands of other “rulers” jobs, I think that the answer (which we may know in hours for certain) is a qualified YES. It IS time to start shooting. Not just shooting back, but shooting in self-defense against the thugs and toadies and shills and subordinates of the “elite” and the politicians and “leaders.” Even though the resistance may be futile. But we won’t know until we try. Mama’s Note: Each person must choose for him or herself, but I choose to avoid violence for as long as it is possible. I will never initiate force against another person in any case. This entry was posted in Nathan's Rants and tagged Claire Wolf, Election 2016, History, liberty, Politics 2016, Self defense. Bookmark the permalink. 4 Responses to Is it time yet? Whatever… can’t do a thing about it except go on living my life as free as possible. If we didn’t give this stuff so much importance… if we simply determined to live and not comply… we’d all be better off. And forget the “jews” thing here, please. Far, far too many people who desperately want to control everyone else – and they come from every race, creed and location on earth. I’m just happy that the witch was shut out… and hope she’ll fade into the woodwork somehow.